Expert video editor and 21st-century satirist Vic Berger has made a lot of hay out of exposing the far-right for how ridiculous it truly is. Whether it’s Pastor Jim Bakker, conspiracy theorist Mike Cernovich, or President Trump himself, Berger is able to use his targets’ own words and mannerisms against them, transporting viewers to a They Live-like world where we can see right through the flashy facade to the disturbing reality beneath. Over his brief career, no one has given Berger more material than Infowars host Alex Jones. In his newest video for Super Deluxe, “American Horror Story: There’s Something Going On With Alex Jones,” we take a look back at the storied career of Alex Jones, from early-2000s nutjob to a modern day nutjob with better production value. Warning: The following video contains a grown man repeatedly denying that the Sandy Hook shooting took place. 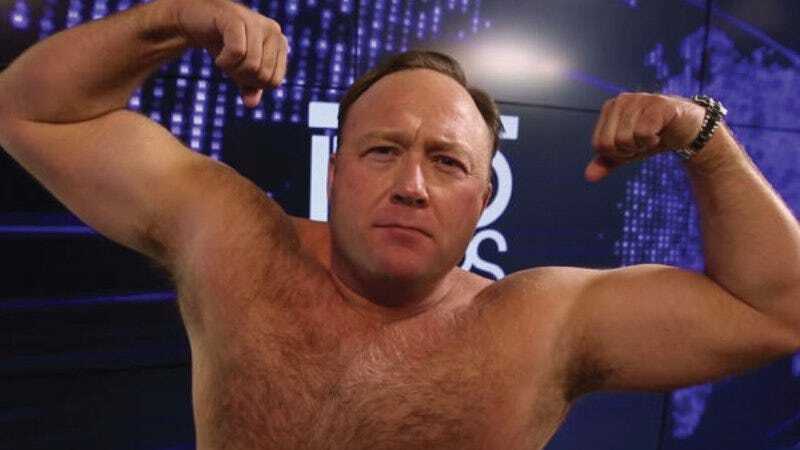 Perhaps the most subtly scathing technique Berger uses—and one that’s a staple of his Jim Bakker videos as well—is the constant reference to the products Jones peddles to his viewers, like the Infowars-branded “Super Male Vitality” and “Super Female Vitality” supplements. This is at first a subconscious and then overt reminder that people like Jones, despite their fiery rhetoric and extreme pseudo-beliefs, are here to sell you stuff. They want your attention and they want your money, and they’re willing to say anything to get it. Oh, and they also want to stop the lizard people.